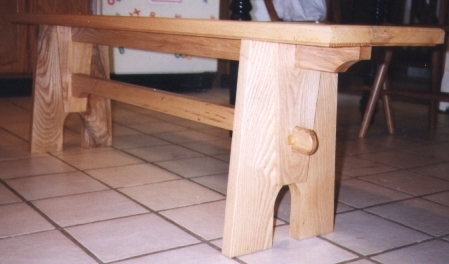 This page contains the description of a 5 foot bench I built in October 1997. The goal was to build a bench that would fit adjacent a 5 foot kitchen table using available materials. The lumber I had on hand consisted mainly of two pieces of 6/4 ash, each roughly 12 inches wide and 6 feet long. I also had some odds and ends pieces of ash which I hoped would be enough to complete the project. The basic dimensions were defined by the lumber stock on hand - the bench top is 58 x 11 x 5/4 inches, which is a little narrower than I would have liked it to be. Luckily, this bench is used primarily by children, so the 11 inch width is not really an issue (yet). The overall height is 17-1/4 inches, which is comparable to a typical dining room chair. Note that care should be taken not to tip the bench over. At 11 inches in width, the bench is narrower than a typical chair is deep, yet equal in height. This makes it potentially more unstable. Of course the 11 inch width is a restriction for me; a wider seat is recommended for those building something similar. Also note that the finished unit is quite heavy due to the dense wood used and subsequently more stable than I had initially feared. Here are three pictures of the bench. First a note on the color of the wood. 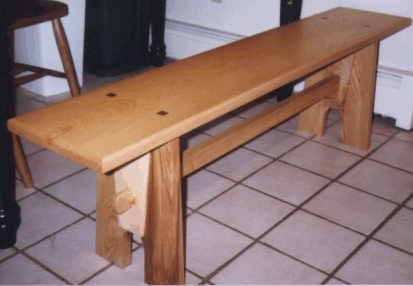 Several different pieces of ash were used to make this bench, leading to variations in wood color. There is quite a drastic difference between the lightest and darkest color. No stain was used so that only the natural color of the wood shows. The middle picture shows that there are four basic parts to the bench - the top, the two legs and a lower stretcher. The top was made from one of the original 6 ft x 12 inch boards, and the legs and beams were cut from the other board. The top has two parts - a flat sitting surface and a reinforcement beam. The top has a 1/4 inch round over on the top and a 1/4 inch cove on the underside. The cove gives it a slimmer look. The reinforcement beam is 2 inches shorter than the top on each end and is notched to hold the two legs (see bottom picture). Its ends are also curved for an added decorative look. The beam is attached to the top from the bottom at three points - in the middle and in the leg notches. Each of the three screws is recessed. The legs cover two of the screws and the middle screwhole is capped with an ash plug. Each leg is made from three parts - a middle 2 inch thick part and two outer 1-1/8 inch thick legs. The three pieces are glued together to form each leg with the outer legs actually dadoed into the middle piece's sides. Three seperate pieces were used due to available materials. This can be easily modified to suit individual resource restrictions. The top of each leg assembly is notched to fit the top reinforcement beam. 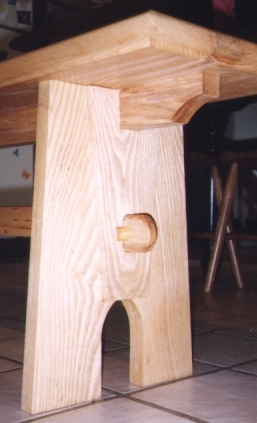 To accommodate the stretcher tenon, a 3/4 x 2 inch hole was bored 7-1/2 inch from the bottom. The lower stretcher serves to prevent raking of the unit and helps lower the center of gravity for added stability. It is 3 x 1-1/8 x 38 (the 38 inches is implementation dependent) and is thinner in the middle for looks (see middle picture). The through tenons are 4 inches long and rounded at the ends for safety and looks (see bottom picture). To lock the tenon to the legs, half of a 3/4 inch dowel is glued in place. A 3/4 inch hole is drilled in the tenon at just the right spot so that only a semi-circle is exposed on the exit side of the tenon. The half-dowel is then sized to fit the opening (see bottom picture). Connect the stretcher to the legs and lock it in place with the half-dowel. Add the top by matching the leg and top notches. To fasten the legs to the top, I drilled four holes from the top of the seat (see top picture), two holes per leg. Each hole houses a recessed lag bolt that screws into the top of a leg. Each hole is squared and a piece of black walnut is used to cap the opening (see top picture). Black walnut is used for color contrast. The finish is Danish oil (Natural) and polyurethane for added moisture and wear protection (from kids !). Be sure to adequately protect the leg bottoms so that liquid spills do not absorb easily into the legs. This bench was really easy to build. It is also, IMHO, quite elegant and well proportioned. The reinforcement beam creates a very sturdy top that barely flexes when supporting large adult loads. The lower stretcher performs very well in preventing raking.